No driver is required for Mac OSX computers. Mac OS standard audio driver will be automatically installed when the DDJ-WeGO2 is connected to your Mac with a USB cable. A Pro Infinity, a Plus Controller or a Pro Subscription License is required to fully use the Pioneer DDJ-WeGO2 Without any of the above Licenses, the controller will operate for 10 minutes each time you restart VirtualDJ. The Pioneer DDJ-WeGO2 is also operating with the bundled VirtualDJ Limited Edition. 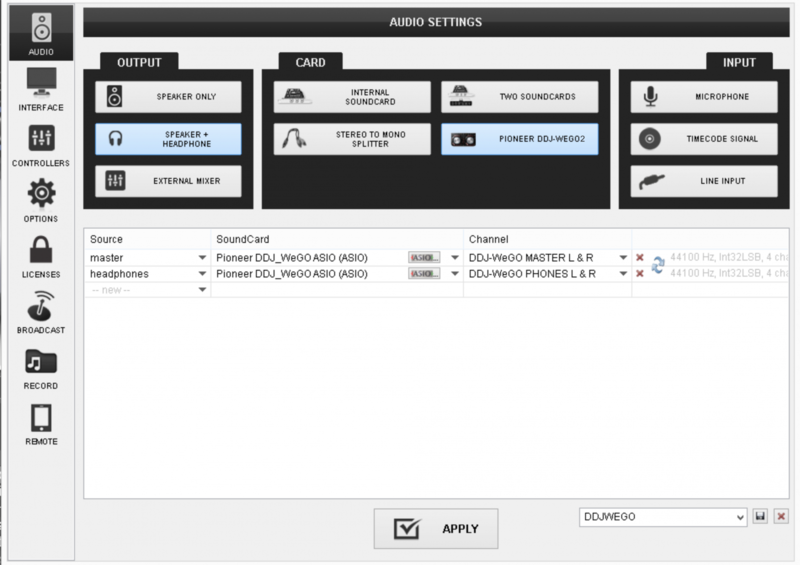 A detection window will appear right after, asking to use or not the pre-defined audio setup with the built-in sound card of the DDJ-WeGO2 Click on the "Use Soundcard" if your speakers are connected to the Master Output of the DDJ-WeGO2. If the tailored WeGO2 skin is pre-installed, an additional button Change Skin will be available to load the skin, or continue with the default skin of VirtualDJ 8. An additional Enter Keycode button will be available if the VirtualDJ 8 Limited Edition is installed. Alternative Audio setups can be applied in the same window.